ALEC-friendly lawmakers, eager to crush public-sector unions, may have instead given them new organizational life. If Iowa lawmakers thought that their Draconian revisions to Chapter 20 could break the back of public-sector unionism, the last two months have proven them spectacularly wrong. 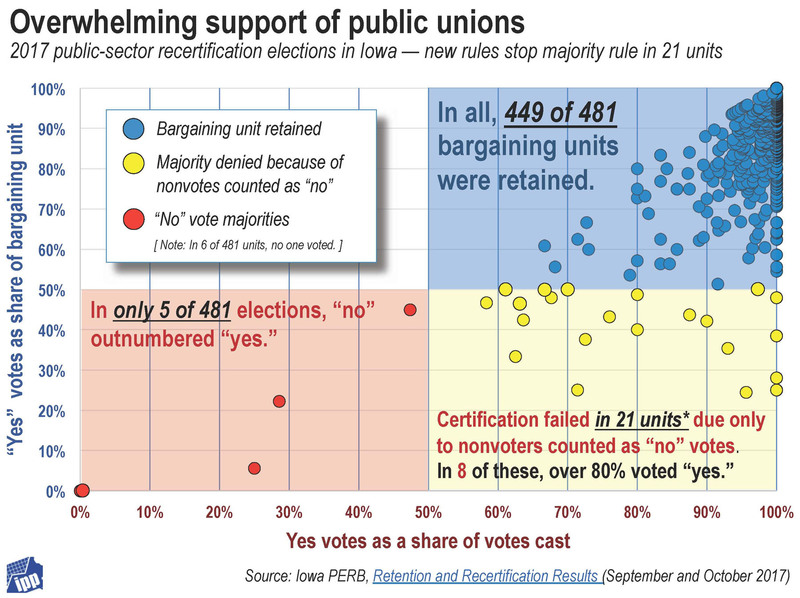 Since early September, almost 500 of Iowa’s public-sector bargaining units have been forced into recertification elections. As is evident in the returns, public-sector workers have not only dug in their heels against the attack on their rights to bargain, but have begun to push back. ALEC-friendly legislative leaders, so eager to crush public-sector unions and silence their political voice, may have instead given them new organizational life. Consider some of the numbers from the September and October elections (summarized in the graphic above). Of those voting, almost 98 percent voted to keep the union. In 229 elections, all the votes cast were “yes” votes. Of the 32 bargaining units (accounting for about 1,000 workers) decertified, only five lost the majority of votes cast; in 21 units, nonvoters — counted as “no” under the new rules — tipped the balance. In six other units, no one voted. A look at the 32 decertification returns suggests results that are starkly undemocratic: At Broadlawns Medical Center in Des Moines, for example, nurses voted 74-27 to stick with SEIU 199. But, because they needed 99 votes to capture half of the bargaining unit, they lost. In the Iowa Falls Community School District, a Teamsters 238 local voted 27-0 to certify. But because they needed 33 votes to capture half of the bargaining unit, they lost. As an example of the success of strong organizing in the face of the rules imposed upon workers, Iowa State Education Association locals in 233 locations mobilized for recertification votes — winning 229 of those and losing only four by a total of 15 votes. Even in those four isolated cases, ISEA was favored by a majority of those actually voting — just not enough to satisfy the special restrictions placed on them by lawmakers.